His life started out normally enough. Brendan O’Connell grew up in Tucker, Georgia, the son of a lawyer. He attended St. Pius X Catholic High School, nearly getting thrown out a few times for discipline problems. He didn’t discover art, he says, until he was twenty-two. “I moved to Paris after graduating from Emory [in 1990] with the idea of writing a novel, and I didn’t realize that ten thousand other people arrived on the same day with the same idea.” He soon met painters and writers from all over the world, he says, “and I just had this funny experience where all the painters were really happy people and all the writers were fairly miserable. And I’m like, you know, I actually kinda want to be happy.” He began painting quick portraits of passersby on street corners in Paris. Still, he couldn’t quit writing; that had been his dream since sixth grade. O’Connell has been painting scenes at Walmarts around the country for a decade now, and in the last year they’ve actually made him pretty good money ($1,500 for small paintings, $40,000 for larger ones) and led to appearances on the Colbert Report, CBS Sunday Morning and a profile in the New Yorker (“that was like a winning lottery ticket,” he says). Before Walmart realized that he was good publicity, O’Connell says, the artist was “thrown out of more Walmarts than the average New Yorker has ever visited.” A half hour after he made this comment on NPR a few years ago, a Walmart rep called to offer him full access with his paint and brushes. Stationed near the splashy displays at the front of the Walmart Supercenter on Lawrenceville Highway yesterday, he was not bothered. Employees had been briefed on his two-day residency here, next to Accessories World and Payless ShoeSource, and they buzzed around, hoping to make it onto his canvas. Others not so much. A shopper nearby picked up a bunch of her own bananas, eyeing O’Connell suspiciously. Making art in a Walmart? Who was this slightly overweight, shaggy-haired, bespectacled man in tattered jeans and running shoes with a 24×36 art panel balanced on a shopping cart by the pretty fruit display? And a vegan, you say? O’Connell has two paintings on display at Walmart headquarters in Bentonville, Arkansas. He is the closest thing they have to a company artist. He’s been to hundreds of the stores over the last decade. He gestured around this one, which is 134,000 square feet, seven years old, and a few minutes from his boyhood home. “They really exemplify the geography of the place,” he said. “It’s very provincial. This store is a very Latino, African-American, white mix. You don’t find this everywhere.” Nearby there was a Duck Dynasty throw towel for sale. Some of his Walmart paintings are impressionistic, others more literal representations. They’re of Coke displays, bra racks, Elmer’s glue, a young girl walking through the candy aisle. They don’t make fun of the store or its denizens, which wouldn’t be hard to do. If anything, they make it feel more magical. 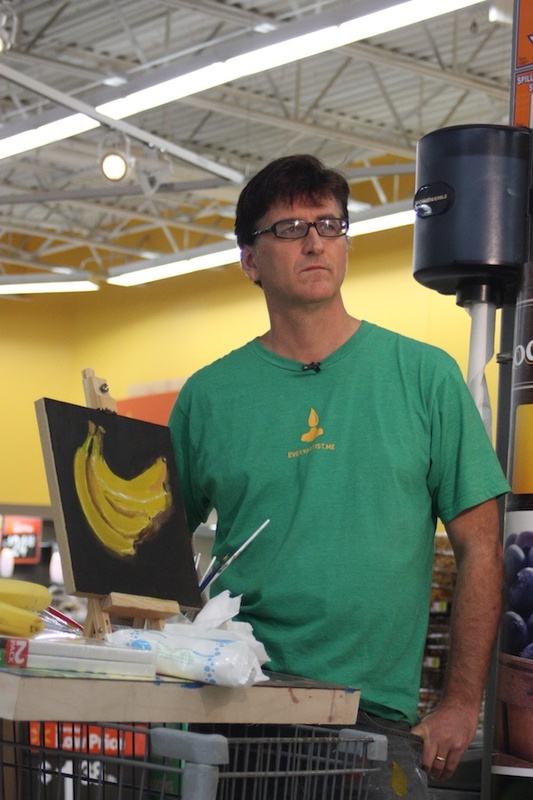 He’s not just in Atlanta to paint magical bananas, however. He’s here to recruit students for the second annual art event put on by his non-profit Everyartist.me, a national collaborative art project that’s meant to “spark the next generation’s creativity.” (It’s sponsored by Walmart.) On November 21, O’Connell hopes he’ll stage the “largest art event in history,” perhaps a million school kids artistically interpret the theme “gratitude” and upload pictures of their art to his web site. O’Connell may soon have a book published after all. He and his wife live on a farm in Litchfield, Connecticut, not far from Jasper Johns, perhaps the most famous living American painter. Never heard of him? “Why don’t I come to your house and set-up in your living room,” he said, after a little small talk and an explanation of the Everyartist.me project.